This morning I practiced one of my classes on My Yoga Online. Levi sat in front of me in his rocking chair smiling and laughing if he liked a pose, and waved his arms and let out disapproving cries if he didn't. Practicing yoga with Levi nearby puts everything into perspective. He definitely helps me stay present and constantly reminds me to see the joy and silliness in everything! 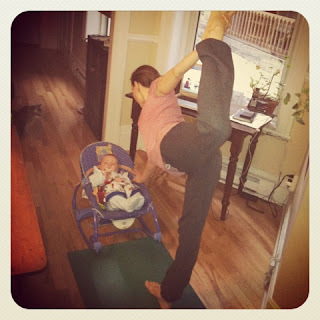 Posted in "Jennifer Maagendans", "Mom and Baby Yoga", "My Yoga Online", "Yoga Flo", "download", "video"